Anyone who has ever planned a large party or even their own wedding, knows that it can amount to one huge headache! Details are important in any event and most of the time, these are what can be overlooked. Saying thank you to your guests by providing them with unique and thoughtful favors and gifts really helps to convey how special these people are in your life. Assisting you in selecting the perfect favors and gifts is what Partease specializes in! They want your next soiree to be a hit, right down to the last detail, and have plenty of products for you to choose from. 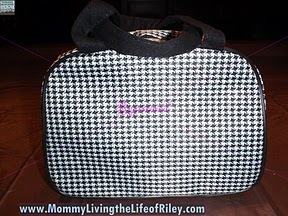 I reviewed the Let's Do Lunch Personalized Insulated Lunch Tote from Partease, which retails for $35.00. Free shipping on all orders over $149. Also, 5% of the proceeds from every sale are donated to Action Against Hunger. I remember when I got married... I planned the whole thing myself and had the hardest time trying to find something special, memorable and USEFUL to give my bridesmaids. I wanted something to show them that I was so appreciative of them being in my life as well as standing by my side on my big day. I remember searching all over the internet to try and find something special and eventually gave them a monogrammed tote bag, a monogrammed jewelry travel case as well as the jewelry I wanted them to wear on my wedding day. I didn't know about Parteaseback then, but after looking through their site thoroughly, I really wish I would have! They have some adorable favors for not just weddings, but baby showers, birthdays and anniversaries too! 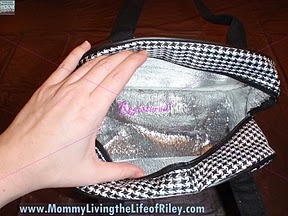 I got to review the Let's Do Lunch Personalized Insulated Lunch Tote and just thought it was the cutest thing! 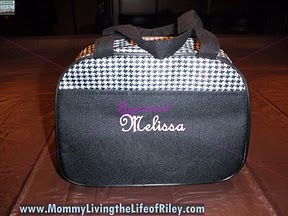 As you can see from the pictures above, they personalized this black and white houndstooth-patterned lunch tote with my name on the front pocket. This front pocket is the perfect size for storing additional snacks, such as granola bars or boxes of raisins, or even your silverware and napkins. The inside pouch is lined with insulated material to keep your food at its desired temperature and is also quite roomy. I could easily fit a sandwich, apple, bag of chips and a drink inside. 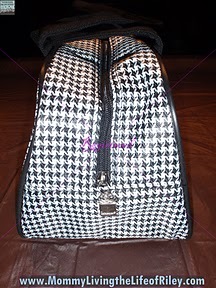 The zipper seems sturdy and even has a tiny silver present dangling from the zipper handle itself. I think this adds a nice touch and will help the recipient remember that this was a special gift just for them! 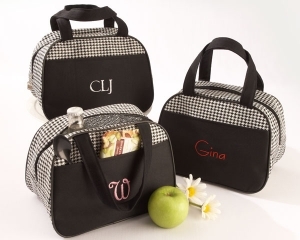 Overall, I think the Let's Do Lunch Personalized Insulated Lunch Tote would make an excellent bridal shower, baby shower or even birthday party favor. Everyone eats lunch and could use a jazzy little bag like this. Partease definitely has you covered when it comes to wonderful ideas for the favors at your next big bash! Disclosure: I received the Let's Do Lunch Personalized Insulated Lunch Tote from Parteasein order to facilitate my review. No other compensation was received. This product review is based on my own personal experiences with this item and is completely honest and objective.